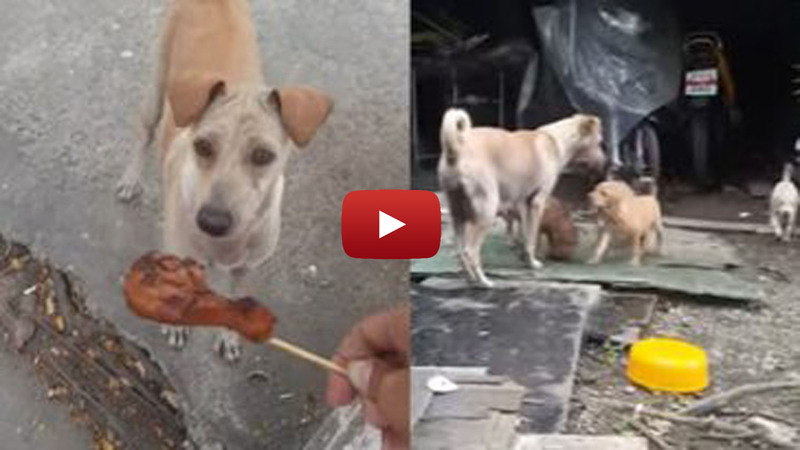 This Dog Begs for Food and Rushes Back Home with it—to Bring to Her Hungry Little Puppies! She was obviously hungry too, but her puppies come first! Mothers always put their children first—even if it means they have to make sacrifices. They make sure that their children are well-fed, safe, and are comfortable as can be. While many believe this trait is unique to humans, animals actually exhibit this kind of behavior. I guess mothers will always be mothers—animals or humans. This dog begged for a grilled chicken from a stranger and rushed away. The man was surprised after the dog came back for the second time—wanting another chicken. Her odd behavior made the man curious, and so he decided to follow her. What he saw next was heart-warming! Despite being hungry herself, she rushes home and brings the food to her puppies, who were excited upon seeing their mom. This just goes to show that animals sometimes exhibit human behavior, especially when it comes to taking care of their little ones.